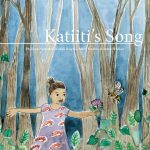 Every day, Katiiti’s mother calls her with a beautiful song. One day, a crafty gorilla tries to sing as sweetly as her mother. Created at Book Dash Cape Town on 5 March 2016 by Philippa Namutebi Kabali-Kagwa (writer), Mary Marble (illustrator) and Kirsten Walker (designer). Edited by Helen Moffett.